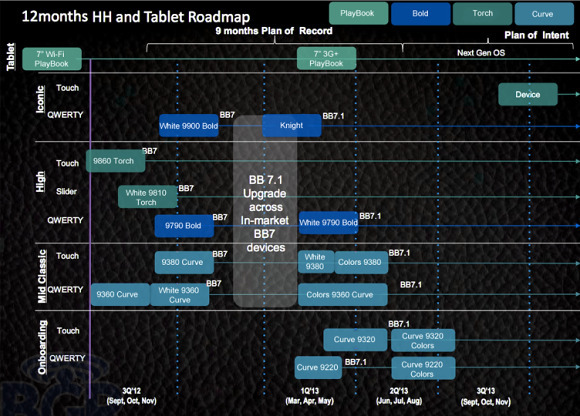 A recently leaked RIM roadmap reveals all the upcoming BlackBerry smartphones for 2012. Unfortunately there is nothing really interesting scheduled before November this year. RIM is preparing two new mid-range Curves for the spring season - 9220 and 9320 - for Q1 and Q2 release respectively. White Bold 9790 and Curve 9380 will hit the market in March or April as well. The BB OS 7.1 update is already out for all compatible devices, while RIM is expected to demonstrate the newly announced OS 10 at the upcoming MWC. Speaking of OS10, the first smartphone to run it - codenamed London - is scheduled a bit later than expected - November 2012 or later. Finally, if you have been waiting for a 3G-capable PlayBook tablet, it's coming in Q2 2012 quarter. As you can see there is nothing really impressive on the roadmap (and Milan is expectedly absent), but we should have been prepared for that already. Whatever the next OS is like, RIM is still the RIM we know - always behind the others. Your new series 9220 is plain vanila ice creame.